Stationary piston coring – or “Kullenberg” coring – is a system that made very long coring possible , by countering the effects of friction between the sediment and the liner with the vacuum created by a piston, that acts like an inverted syringe. 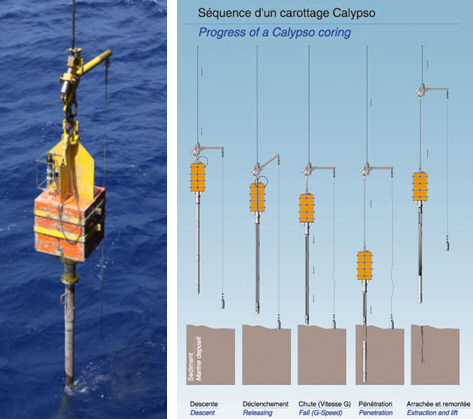 This system has originally be developed for coring up to 20 metres, but it has been re-designed in order to be able to core up to more than 60 metres (the record is 64 metres), this version is called Calypso II. It has been designed on the Marion Dufresne in the mid-nineties and is still under development. The C2FN is mainly focusing on this major technology. Its functioning is described on the picture above. 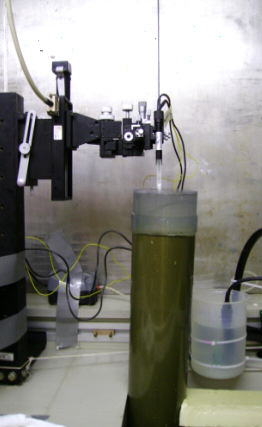 Gravity corers used to be empty pipes mounted under a lest, and this weight pushes the pipes into the sediment while the cable is unwounded. There is no piston that could stretch the sediment by depression. 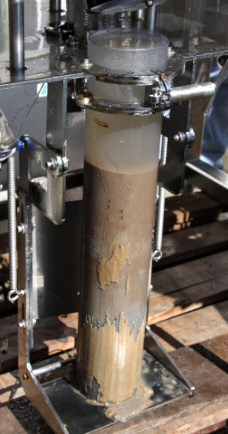 But this system is limited in length of sample because there is no compensation of the friction between the sediment and the inside part of the corer. So the layers tend to be compressed when the pipe is too long, and then form a tap obstructing the corer. To maximize the efficiency of this gravity corer, the CASQ has a wide square section (25cmx25cm) : the centre part of the core section is perfectly respected on big lengths. It can take very good quality cores up to 12 metres. Different types of interface corers exist, their pipes goes from 30 cm to 1 metre, from 1 to 8 pipes on a single corer. 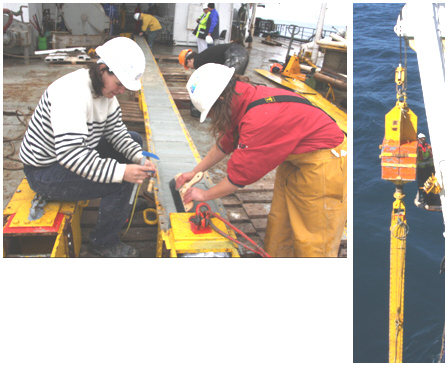 Not only they take the sample of sediment but also the interface & interstitial water that can be used for various complementary studies. It can also be equipped with instrumentation, particularly with video cameras.